Jess McCluney has been closely involved in marine fisheries issues for the past 15 years with both a Masters in Marine Management and practical experience inside multiple types of complex seafood supply chains. She has worked aboard commercial fishing vessels, lead socioeconomic research projects, and headed up corporate sustainability & communications programs for leading North American seafood companies. Jess has sweat on location in dozens of fisheries alongside harvesters, processors, fishing communities, government agencies, and research institutions across 11 countries spread over 6 continents in her career span. 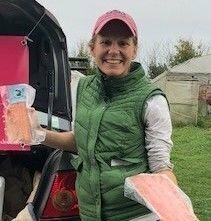 In addition to bringing Seattle households Algrano Fish, Jess also continues to work with seafood suppliers and the environmental community to navigate and improve the sustainability landscape.